Variations on a Ground (hereafter “VOAG”) uses thirty-two unique pitches, not counting octave duplications, though not all of the pitches occur in every part. This collection of pitches is not the product of any equal division of the octave, but is, rather, an example of “extended” seven-limit Just Intonation. That is to say, it is based on the degrees (2, 3, 5, 7) of the harmonic series. The ground bass itself is simply a descending pentatonic scale based on the harmonics 2, 3, and 7 (Figure 1), combined with a “talea” (rhythmic pattern) two measures long to create a ten-measure repeating pattern. The scale of the ground features wide major seconds (8:7 = 231 cents) and narrow minor thirds (7:6 = 267 cents), similar to a Javanese slendro scale. All of the other pitches used in VOAG were chosen to form mainly consonant harmonies in conjunction with the pitches of the ground bass. Most of the chords used are derived from the harmonic pentad (Figure 2), a just version of a dominant ninth chord. Although all of the intervals of this chord differ from those of the 12-equal equivalent, the most conspicuous differences are in the major third (fifth harmonic), which is approximately 14 cents narrower than the 12-equal major third and in the minor seventh (seventh harmonic), which is approximately 31 cents narrower than the 12-equal minor seventh. These intervals (and all the intervals comprising the harmonic pentad) are the most psychoacoustically consonant versions of their respective interval classes. The pentad is never heard in complete form as a chord, but its subsets provide most of the harmonies used in VOAG. The intervals between the degrees of the pentad include four distinct consonant (or at least semi-consonant) thirds: 5:4, the major third (~386 cents); 6:5, the minor third (~316 cents); 7:6, the subminor third (~267 cents); and 9:7, the supermajor third (~435 cents). The intervals 5:4 and 6:5 are the familiar thirds that comprise the maximally consonant forms of the major and minor triad. The subminor third, 7:6, narrower than the 6:5 minor third by approximately a quartertone, is a darker but nevertheless quite consonant interval. The supermajor third, 9:7, can sound quite harsh when heard alone, but forms an essential part of the consonant subminor triad (HS degrees 6:7:9), which is used extensively in VOAG. 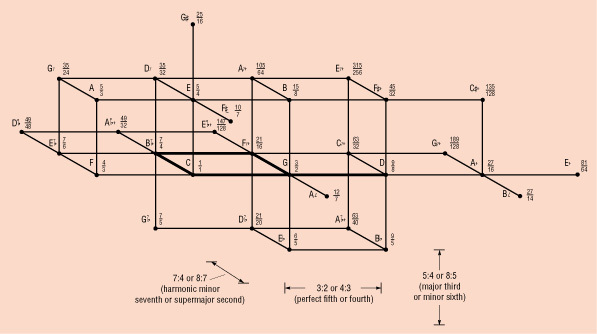 Two of the degrees of the scale of the ground bass are themselves seventh harmonics (F [21/16] the seventh harmonic of G, and B [7/4], the seventh harmonic of C), and are hence quite flat. These two tones, in turn, serve as roots of pentads; all of the tones of those pentads are therefore proportionally flat, but their harmonic sevenths (E [147/128] and A [49/32] respectively) are especially so, being only about 36 cents—slightly more than a sixth-tone—above D and G, respectively. Among my primary goals in composing this piece (in addition to composing emotionally and intellectually satisfying music, which is always my goal, regardless of what technical devices I might use) was to explore the microtonal voice leading that inevitably results when chords that include the seventh harmonic are connected by simple-ratio root movements (see my article “Microtonal Resources of the Seven Limit” in 1/1 6:1 [Winter 1990] for details). Such voice leading abounds in VOAG and, as a result, individual parts, especially the inner voices, may sound quite strange when played alone; but when played together, they produce the progression of mostly consonant septimal chords that I desire.